Very few people enjoy trips to the dentist. How often do you hear someone declare tha t they can’t wait to go for their regular tooth cleaning? The grinding, the chipping away with sharp instruments, and the polishing is enough to make most squirm just reading this. But, while the experience may be unpleasant, it is extremely important to get regular dental checkups and to maintain overall oral health. While we often think of oral health issues as being isolated to the mouth and teeth, oral health and total overall health are linked. Poor oral hygiene can, of course, lead to issues such as tooth decay and gum disease. However, it can also result in cardiovascular disease, endocarditis, and potentially premature birth. Conversely, common disease states such as diabetes and osteoporosis can cause oral health issues. Additionally, some common medications such as antihistamines, diuretics, and decongestants can have a negative impact on oral health factors such as saliva production. Therefore it is important to maintain good oral hygiene for both healthy and unhealthy individuals. So what preventative steps can we take to maintain oral health? Well the first should be easy, as all of us learned it from the time we were toddlers. Brushing at least twice a day helps to remove acid build up on the teeth from the breakdown of food, thus preserving the protective enamel that coats the teeth. Brush thoroughly, being sure to contact all surfaces of the teeth. If brushing after each meal isn’t always possible, rinse your mouth with water after eating to help wash away food particles. And while recent research has called into question the benefits of flossing, it is certainly not harmful to floss at least once a day to provide an even more thorough cleaning. Much like all other aspects of health, what we ingest plays a large role in oral health. Tobacco usage has a large negative impact on dental health and should be avoided. Likewise, high sugar containing beverages like soda and juices should be limited, as sugar can wear on the enamel of the teeth. Additionally, obtaining the right amount of calcium in the diet is essential as that can help to strengthen the teeth. Finally, bite the bullet and see your dentist regularly. Not only are routine checkups great for maintaining hygiene, but they can also spot issues such as cavities early before they become difficult (and expensive!) to treat. Visit the dentist at least twice per year, and whenever toothaches or jaw pain appears. 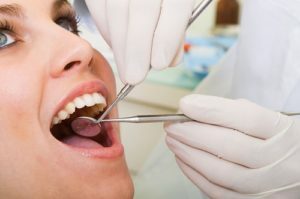 While we often think oral health issues are limited to being treated in the dentist’s office, and many are, such as cavities and root canals, as a pharmacist, I often treat patients experiencing some difficult conditions related to the oral cavity. One of the most common complaints patients present to us with in the community pharmacy is dry mouth. This can be the result of many different factors such as medication, other disease states, or improper diet. Obviously staying properly hydrated is a key factor to treatment in this arena, but sometimes, that is not enough. In those cases, patients can benefit from over the counter products that help to increase mouth lubrication, such as Lubricity™, a topical spray used after each meal. For patients with extremely difficult to treat dry mouth, medications which enhance salivary production, such as pilocarpine, can be made in special dosage forms like lozenges or lollipops. By sucking on the lozenge or lollipop, the patient gets an increase in saliva production while avoiding side effects in the rest of the body from the drug. Another condition we see quite often in our practice is patients with oral lesions. These sores, such as canker sores, can be extremely painful, and interfere greatly with quality of life. These conditions can result from a variety of factors, be it stress, diet, or other illnesses, and can be stubborn to treat. Some of the best treatments for these are oral medicated mouth rinses which combine multiple drug classes, such as steroids, antibiotics, antifungals, and anesthetics, into one rinse. These rinses often go by names such as “Rothwell’s” or “Magic Mouthwash”, and are swished around in the mouth regularly throughout the day to coat the sores, and help to both soothe irritation and speed healing. Finally another condition we sometimes see is “burning mouth syndrome”. Burning mouth is just what it sounds like in that it often causes a strong tingling or burning sensation throughout the mouth. This sensation is often felt on a consistent basis and can be quite difficult to deal with. Many patients experiencing this may benefit from over the counter supplements like lipoic acid which may help to alleviate the nerve sensation. For those patients with difficult to treat instances of burning mouth, medications such as clonazepam and capsaicin can be made into mouth rinses or lozenges. By placing these medications in the mouth, the overactive nerves causing the burning are in effect numbed out, and the patient achieves relief. These types of specialty medications and supplements listed above are generally found at pharmacies which specialize in vitamin supplementation and the art of compounding, such as Pine Pharmacy in Williamsville. Following proper oral hygiene and having any dental issues addressed in a timely fashion is a great way to keep your mouth clean and healthy, and stop it from affecting other aspects of your health. Don’t ignore it, or else you will find yourself regularly in the dentist’s chair, and paying a lot of hefty dental bills. Remember, there is a reason root canals are often used as a metaphor for some of the most unpleasant things in life, so do your best to prevent them!